What could be more of a delight to a woodturner than coming home from a great weekend -seeing old friends- to find a crotch of an old Irish Yew tree (var fastigiata) in the driveway. 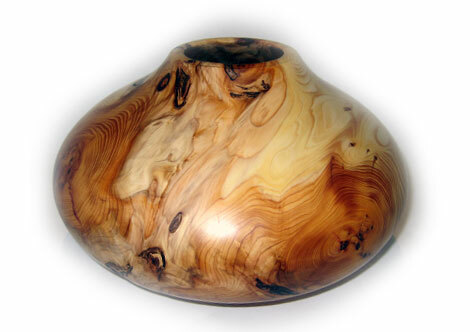 I could immediately see that there would be some interesting colours and patterns in the wood and that a hollow formed vessel would enhance and show off the figuring to its best advantage. Eager to get into the workshop the chainsaw was used to carefully cut the wood into a suitable shape to screw onto a face plate for the VB36 lathe. While turning the vessel –using my 5/8th bowl gouge for the outside and Kelton Hollowers for the inside I pondered over what kind soul had left the wood for me. Would I ever find out? My neighbour had the answer-It was a local gardener who had seen the wood “going to waste” and had thought of me. The vessel cleaned up well –I even managed to smooth the inside with the aid of a squash ball covered with abrasive paper on the end of a suitable stick. The piece was finished with herb & resin oil and micro-crystalline wax polish. Next stop- a local gallery.